Our KiwiExperience bus pass includes a tour of New Zealand’s north and south islands. Over Christmas we completed a large section of the South Island. In April we flew back to Queenstown and traveled north to Auckland. I have broken the 10-day trip into two parts: North Island and South Island. This post covers the South Island: Queenstown to Picton. I was especially excited to explore the northeast region of the South Island as I had not been there before. Upon landing in Queenstown it was impossible to ignore the arrival of autumn. Yellow and orange leaves were reflected in Lake Wakatipu as we walked in Queenstown Garden. We marveled at having been to Queenstown for each of the seasons. Fall is my favorite – not too cold, but chilly enough to relax beside Bardeaux’s roaring wood fire. The next stop was Christchurch. I was shocked at how much construction and demolition still needs to occur four years after a devastating earthquake. 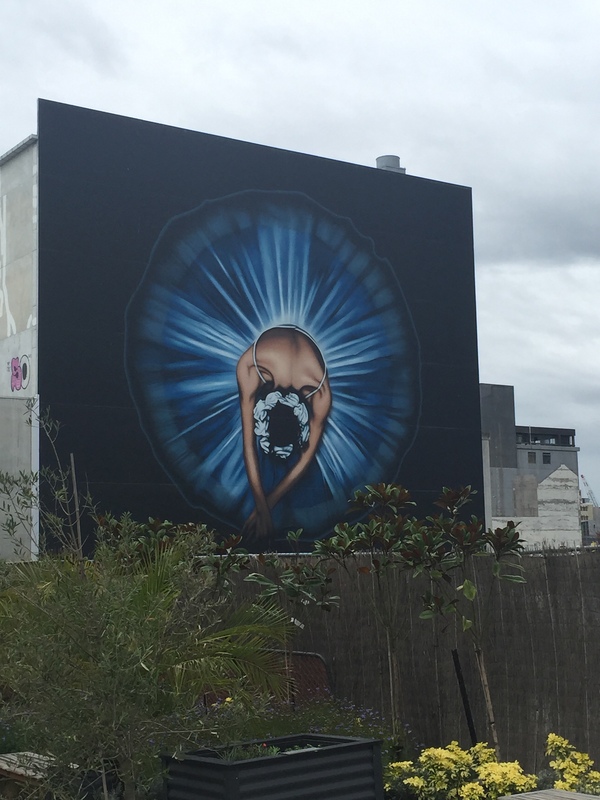 Exploring Christchurch was my favorite part of this trip. There is an energy of hope and resourcefulness that permeates the city. Although the rebuild seems to be taking forever I got the feeling it is being done in a comprehensive and thoughtful manner. After Christchurch we drove north along the coast. We spotted seals along the shoreline as we entered Kaikoura. The wildlife watching got even better when we went to Ohau point where the pups played in the protected stream and waterfalls. Picton was the last stop on the South Island. 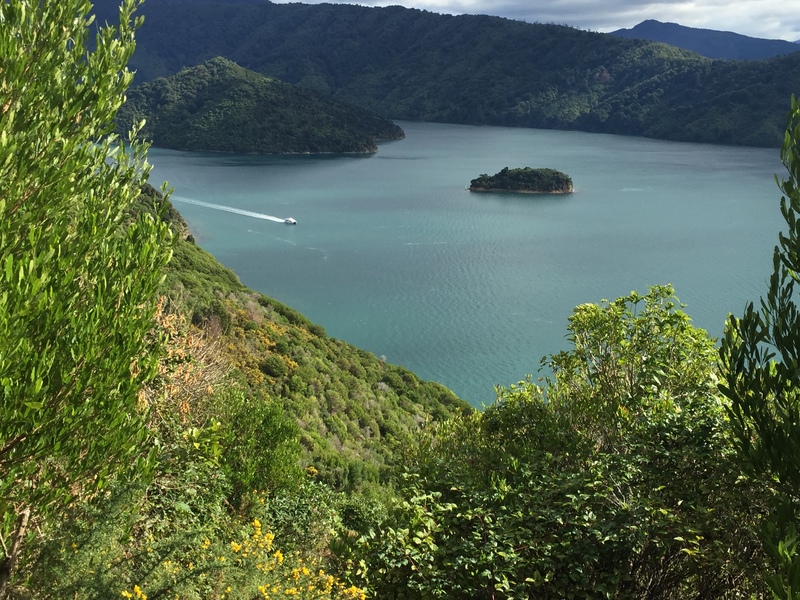 We did not have enough time for an overnight tramp on the Queen Charlotte Track, but made do with a 3-hour hike on the Snout Trail and were rewarded with stunning views of the placid Marlborough Sounds and interisland ferry. The next morning we were passengers on that same ferry, taking a rocky ride back to the North Island. Arrived on Air NZ 647 at 4pm. I realized I let my phone at AKL and spent part of the evening tracking it down. Appreciated the autumn colors with a walk around the Queenstown Gardens. Enjoyed Otago wines fireside at Bardeaux. Stayed in a double with ensuite with private patio at YHA Queenstown Central. Great value! Cromnut at Cromwell Bakery for morning tea in Cromwell; their version of the cronut. 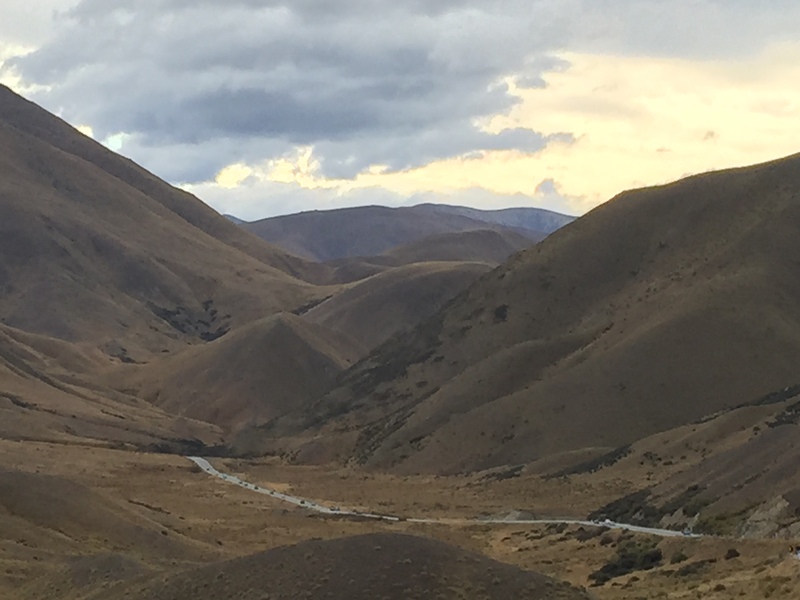 Drove through Lindis Pass, entering Lord of the Rings territory. Windy photo stop at Lake Pukaki, rock flour ground by the glacier creates the turquoise color; views of Mt Cook were hidden behind clouds and rain; the small shop selling local salmon has frozen less expensive fillets but you have to ask to see the selection. In Tekapo we visited the Church of the Good Shepard and the nearby sheepdog statue. Stargazing at Mt John was cancelled because of clouds and heavy wind. Yummy frittata and coffee at 77 run. Jade Palace – never again! The service was so slow and they were out of the wonton soup I wanted. Settled for a disappointing thick sweet & sour soup. Allen’s dumplings were boiled. Stayed at Lakefront Lodge in a 4-person dorm. Weather was cloudy with too much rain, 12-19 C.
Enjoyed craft beers at Old Pomeroy Brewery. Loved the vibe at this pub! Shopping at re:START and Ballantynes. The Rebuild Bike Tour with Natalie was very informative and included many of the city’s main sights including the Cardboard Cathedral, 185 Empty White Chairs, Avon River, and pop up art around the city. As the only customers on mondayised Anzac Day it was a private tour. Drinks/coffee at The Last Word Whiskey Bar, C1, & Coffee House. Walked forever for lunch at Burgers & Beers Inc. Attended Catholic mass at St. Mary’s pro-cathedral. Wine tour cancelled due to overbooking. Stayed in a private room (with tv!) at YHA Christchurch; will happily stay here again. Next time: wine tour in Waipara and check out Hanmer Springs. It will be neat to see how Christchurch has changed when we return in 5-10 years. I was amazed at how much construction and demolition still has to happen more than 4 years after the earthquake. For example, the police building should be imploded any day. The rain finally stopped, but clouds remained and our whale watching tour was cancelled. 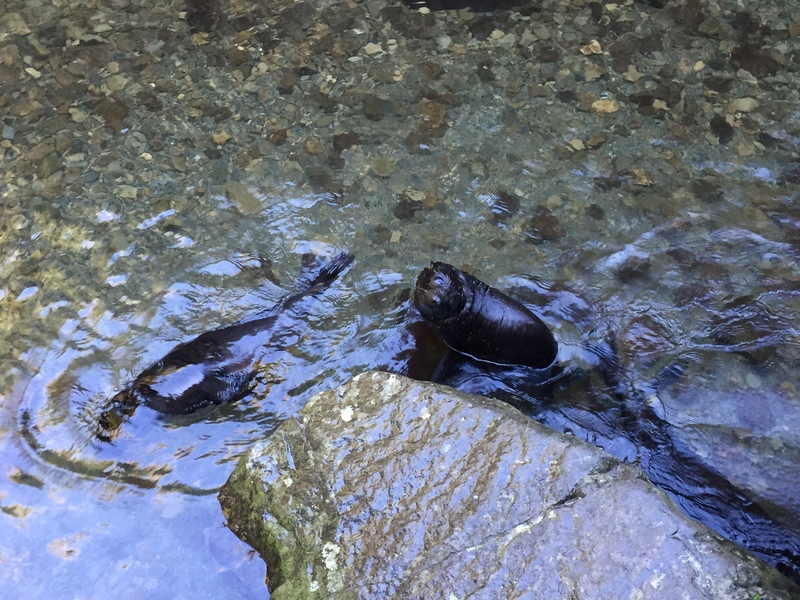 I can’t get enough of the seal pups playing in the waterfall at Ohau point. THE BEST seafood chowder at Tuti’s. “Kaikoura” means “eat crayfish” so I was disappointed there was no crayfish on the menu, but weather prevented fishing the day we were there. Stayed in 6-person dorm at the Lazy Shag. Kaikoura is spread out so if you will be exploring on food give some thought to what you will be doing before selecting accommodation. Weather was cool & crisp; the storm finally moved on. Completed a 3-hour hike to the Queen Charlotte lookout on the Snout Trail. Beautiful walk! National Whale Centre was very informative and worth a walk through. Enjoyed lunch & brekkie at Picton Village Bakkerij. Delish! Stayed in a private room at Villa Backpackers, a new YHA.